They are partners in life, business and creativity. 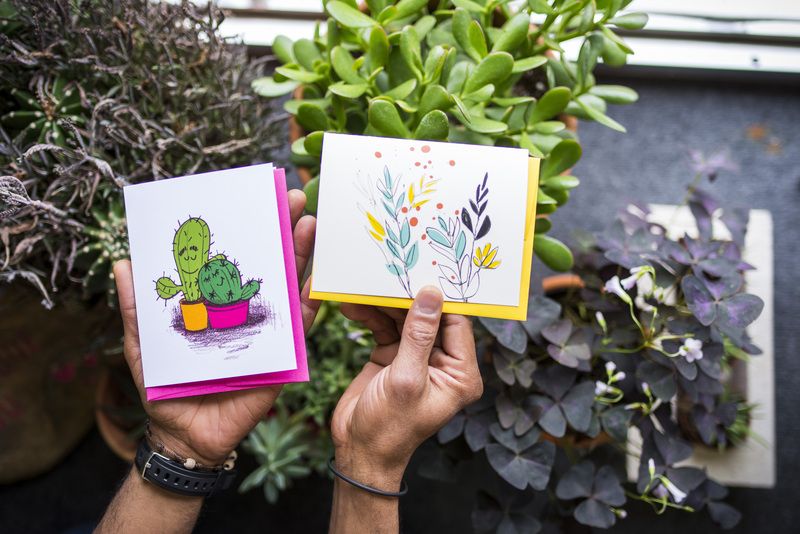 And it takes all three things to make their Tiny Greenhouse bloom – with pretty pottery, one-of-a-kind antiques, cute cards, and an abundance of well-loved plants. Suzanne and Edgar Cabrera first moved to Greensboro so Suzanne could pursue a Master’s in interior architecture at UNC Greensboro. She thought she was going to use her journalism degree and go work for a design magazine. Her passion sparked a flame in Edgar, too. He’d been working restaurant jobs, but soon joined her to pursue a Bachelor’s degree in interior architecture. She ended up teaching at UNC Greensboro. Edgar wound up with an impressive job working as a visual merchandiser for an Italian leather furniture company in High Point. He traveled around the country setting up furniture showrooms. It was a good gig, but Edgar wished it allowed for more creativity. 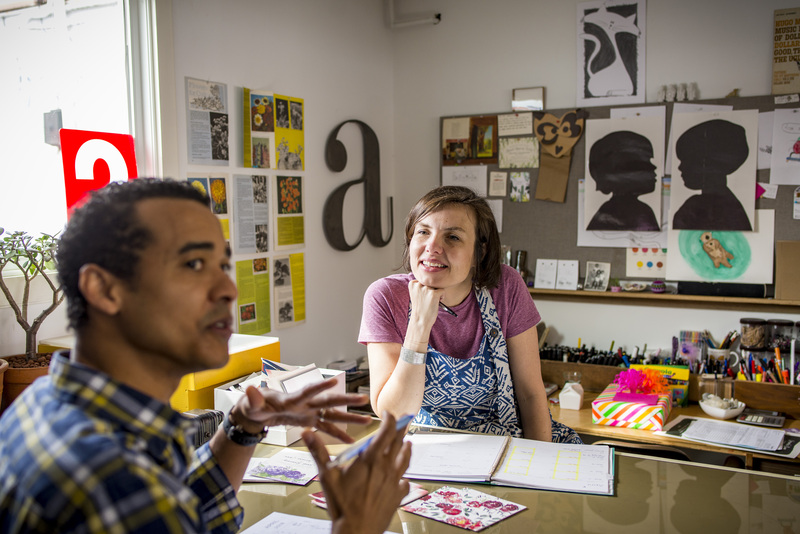 Suzanne started her own design studio, An Open Sketchbook, and she started doing illustrations for clients, including magazines, and designing greeting cards and art prints. About a year in, she convinced Edgar he needed to join her here, too. They were collaborators, building on each other’s designs. When she got stuck, he would pick it up and keep going. They thought they were going to be the next great greeting card brand. 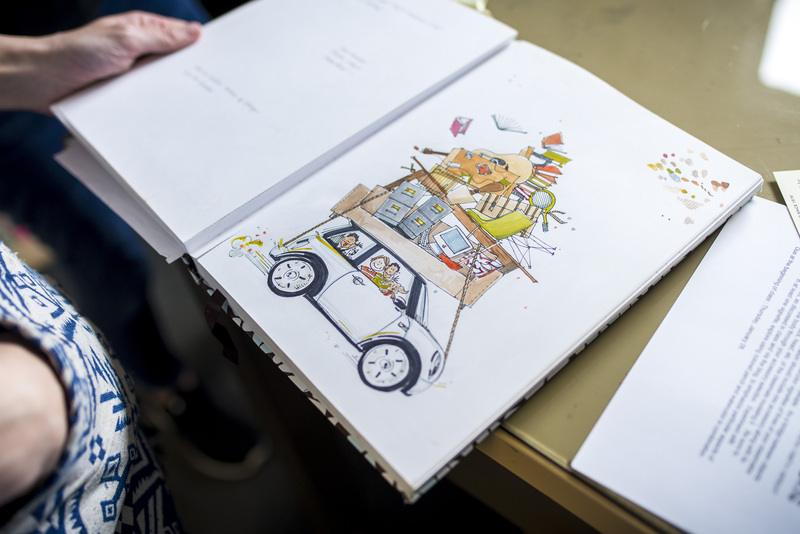 “The year after Edgar quit his job, we exhibited at and did the National Stationary Show in New York,” Suzanne said. “I was ready to hit a home run,” Edgar says. They hustled to get their booth ready. They poured their savings into it. They left their young kids for the first time to go to the show. And they didn’t sell a thing. They went home, put their heads down, and kept working. Fast forward to 2016, when Suzanne and Edgar had a tough year, facing losses in their families. 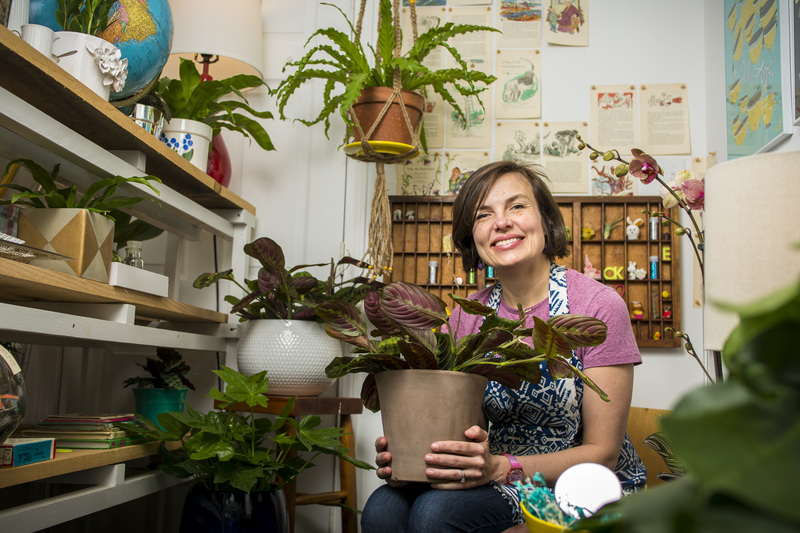 It was Suzanne’s father, in the final stages of cancer, who inspired them to open their store, The Tiny Greenhouse. It would be an amalgamation of their passions. A spot to sell a carefully-curated collection of things they loved: unique gifts and home goods, their design work, antiques Suzanne hunted down, and Edgar’s plants. “Basically we sell whatever excites us,” Suzanne says. They opened January 1, 2017 in a non-descript, 900-square foot brick building tucked away behind Pig Pounder Brewery on Beaman Place. A new year and a fresh start. They’ve been learning how to do this retail thing ever since. They’ve celebrated every sale. They’ve discovered that their hospitality was just as important as their design skills. Edgar spends a lot of time empowering customers to grow beautiful plants. For years, they were his therapy, and now he shares it. “I love this so much. I would do it 16 hours a day for free,” Edgar says. The most wonderful part? They’ve found a diverse little community of The Tiny Greenhouse lovers. Irving Park ladies making their dining room tables beautiful. Little girls from the music academy next door who love their clever stationery. And at least one little boy with discerning taste in succulents. They’re still hustling. But they think they’re on to something. “This is what’s inside of me. This is what I am meant to do,” Suzanne says.